Color: Silver with optic blue. 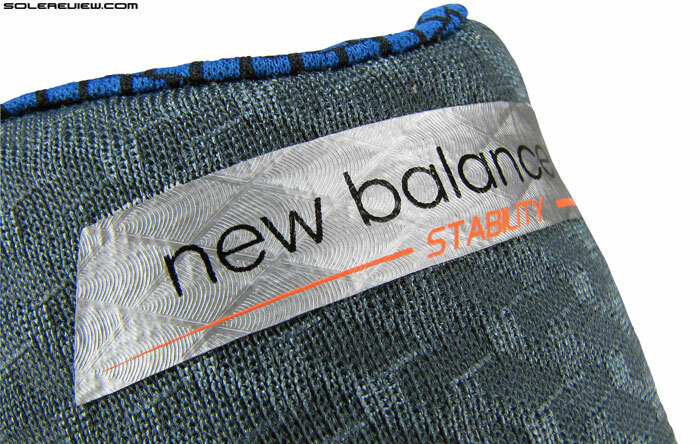 New Balance's marketing pitch: Stable and soft. Upper: Spacer mesh, synthetic leather, hot melt overlays, midfoot strap. 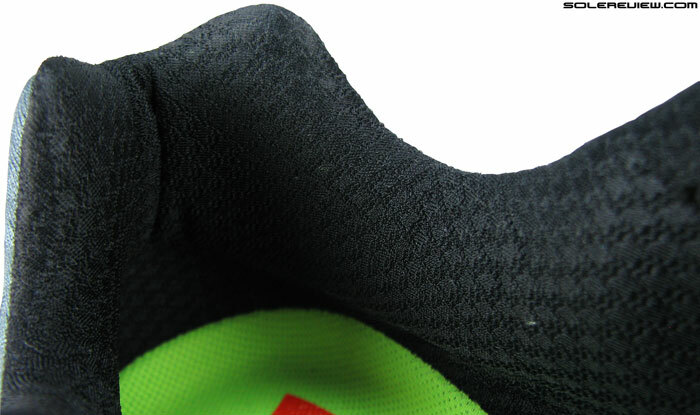 Outsole: Hard wearing carbon rubber in back, blown rubber under forefoot. Widths available: D-Standard (reviewed), B-narrow, 2E-wide, 4E-extra wide. Not so stable as other shoes in its priceband (read Asics, Brooks, Nike, Saucony), but offers a higher level of motion control. Cushioned ride, and reasonably unheavy. 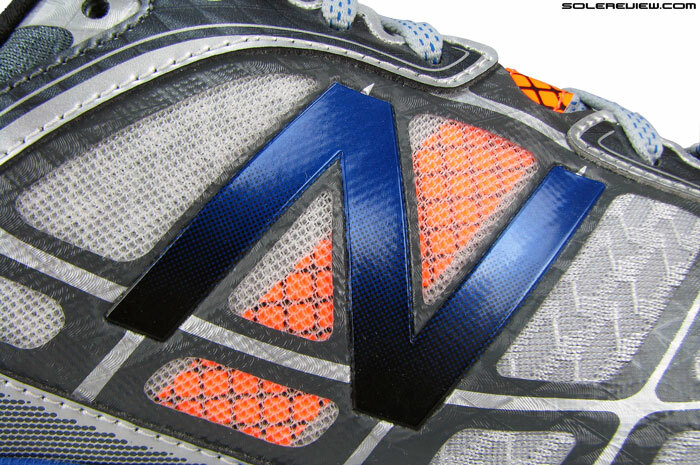 Less reflectivity, tongue front tends to fold over itself, long laces, not as stable as NB makes it out to be. Stability. One word, but many avatars. Of all running footwear categories, the assortment of ‘stability’ shoes is undoubtedly the most confusing to navigate. When a brand tags a particular model for stability, does it mean it is actually stable, or is it a synonym for motion/pronation control? How pronounced is the level of motion control? Is the latter effective for early or late stage kind? Is it cushioned at the same time? How does it differ from a more expensive shoe from the same brand and category? There is simply too much noise to make clear sense of. Stability and motion control. Can this shoe have both? Most brands provide a general description about what the shoe is supposed to do, but more often than not, marketing literature is open to interpretation. New Balance says the 860V5 is meant for ‘stability and motion control’ but that sounds somewhat contradictory, if you ask us. Because for a shoe to have pronation control in any form, convention dictates the use of a lateral midsole bias complemented with a firmer medial post to affect pronation. But once you do that, it causes the foot to lean outwards during footstrike, and that takes a bite off stability, doesn’t it? Think Nike Structure 17 as an extreme manifestation of this principle. The 860V5’s design DNA matches that of the $30 more expensive, made in ‘Murica 1260 V4, which to sum up, was a model which mixed cushioning, stability and a bit of motion control. But that’s as far as appearances goes; when it comes to ride behavior, how close or far is the 860? 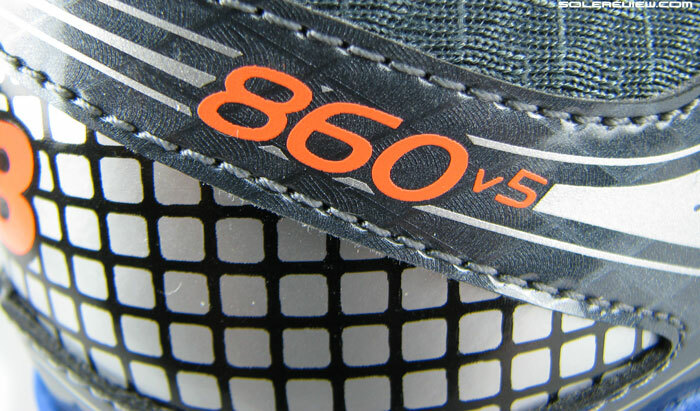 The 860 V5 has more lateral midsole bias than 1260 V4. We’ll come around to discussing the upper fit and material details later, but we’ll start off by saying the 860V5 has a higher level of gait influencing behavior that its higher priced counterpart. Yes, this defies expected tiering logic, but it’s true. The cheaper shoe has a telling difference when it comes to lateral midsole bias, and that’s because the construction fundamental is set apart from the 1260 V4. That too in a couple of different ways, one of them being the use of an uncommon design element. From right to left: Marbled white (hardest), blue (medium soft), white foam (softest). Standard set-up for a motion control shoe. There are three separate foam densities forming the 860 midsole. An expected, medial post (in marbled white) which is hardest of all. 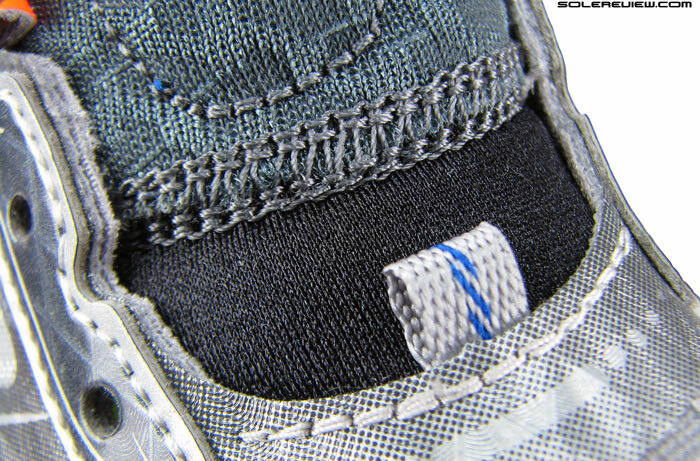 It is then followed by the main midsole (deep blue) which then joins the lateral section, which has the softest density. These are stacked so as to create a lateral bias during the gait cycle. Angular gaps are cut into lateral midsole sidewalls. The midsole wall’s where things get interesting. 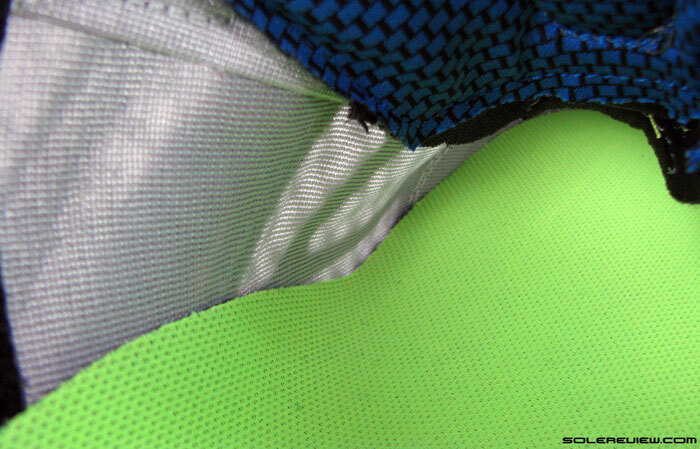 Have a look at the picture (above) and you’ll observe these small cutouts built into the sidewall. Six of them actually; three under the heel and three more (shallow) ones upfront (not in frame), but those resemble notches rather than gaps. 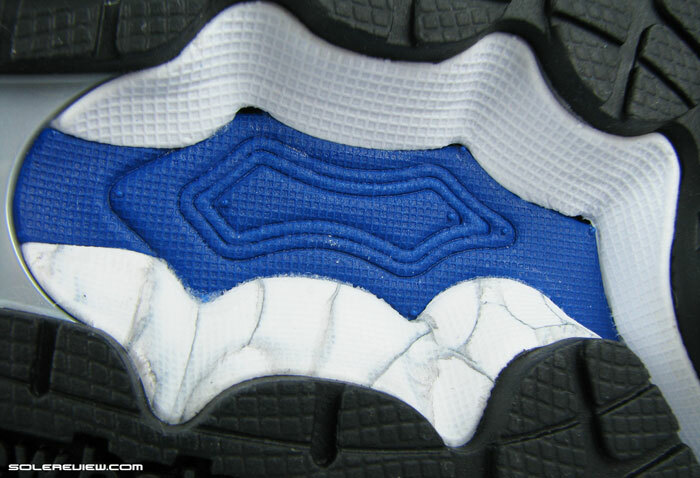 The heel gaps open up inside to a huge cavity between the blue and white midsole foam. And just how deep is this transition altering hollowness? Ford. Go Further. Into the midsole. A humble car key helps shed light on the impressive width of the foamy chasm. The metal key is exactly 40mm long, and all of it disappears inside the midsole. Wait, the tip actually comes out on the other end too. 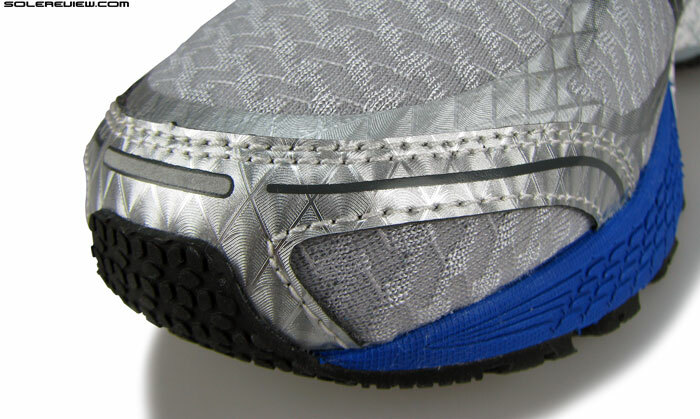 Flip the shoe over, and the confluence of three foam densities is visible right under the heel. Look closely at the base of waffle textured foam; there are these small gaps which connect to the space inside. 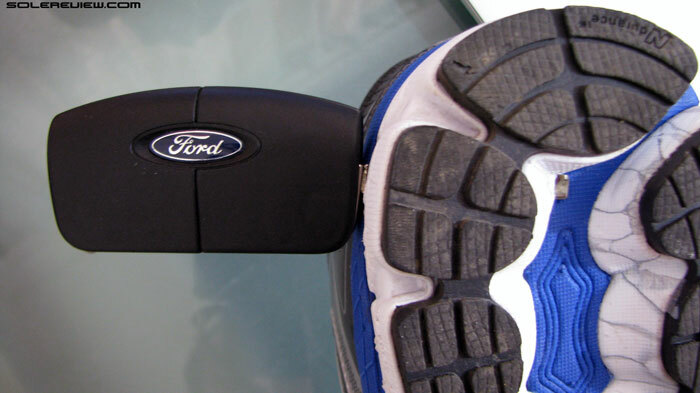 The car key, after crossing the entire span of lateral midsole, comes out at the heel base. That’s a long journey of around 4 centimeters. So, hard solidity of a medial post on the inner side, and a laterally situated cavity built on top of what is a soft layer of foam. One doesn’t need to be a soothsayer to predict what the resulting physics of such an arrangement would be. Weight loading after each footstrike follows the path of least resistance, making the foot lean laterally. And that’s ok; motion control shoes are supposed to do that. 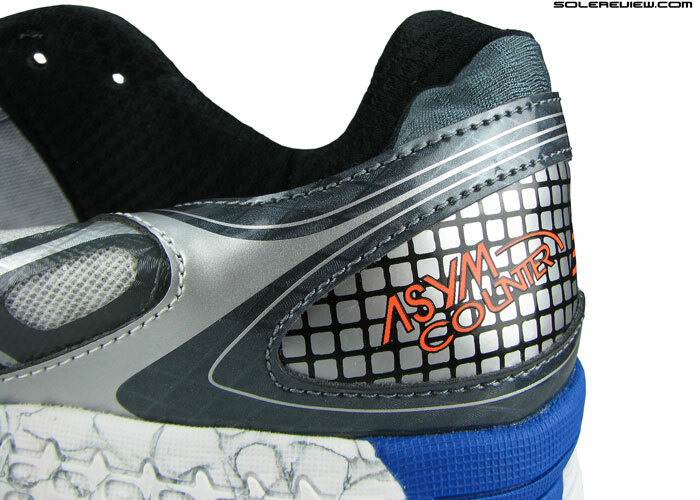 The medial post’s firmness is felt under inner heel, bordering on uncomfortable during slower runs. However, the acute disparity of construction between sideway halves of the midsole makes the medial side feel noticeably stiff. If your runs are nice and easy, 5 mile pace type, then after sometime, the medial post starts pressing upwards into your inner heel. Run like this for an hour, and temporary soreness might happen, more likely on heavier rear-foot strikers. There is a workaround for this, and that is to simply pick up pace. It’s like the squeaky sound coming out of your car at slow speeds; but give it some throttle, and the noise disappears. Conversely, the more time body weight dwells on the harder medial post, more likely the chances that it’ll be felt. That said, the distracting medial post will be felt even by fast runners who like to taper off their workouts with a mile or two of slower pace. So the quirky nature of medial post is the caveat which accompanies the 860 v5, and you are well advised of this idiosyncrasy. Given its rather unusual design, it is a bit surprising that New Balance makes no mention of the cavity on its website. They should have, so that it manages expectations as far as what the shoe’s capabilities are. It is a decent gait control shoe, but we’ve called out the specifics so that you know what are you stepping into, literally. 860V5 has a split midsole. Soft laterally (white), a little firmer medially (blue). Heel has a slight spring (angled bevel) for transitions. Transition gets a few knocks off because of this novel midsole design, as it labors its way out of the heel and onwards to front of the shoe. 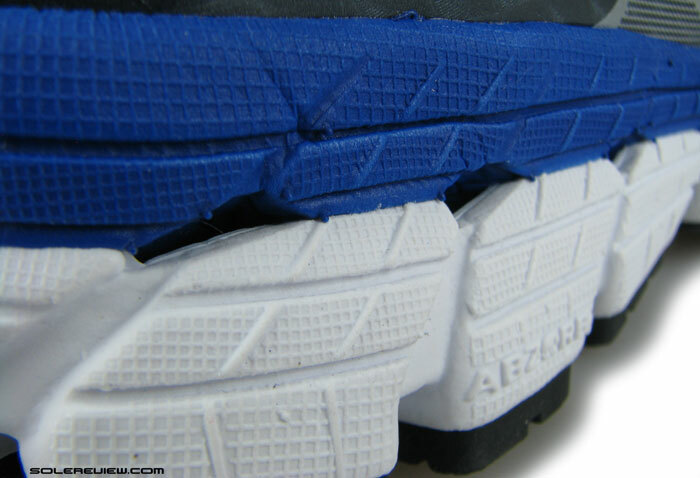 Forefoot is stiff; visually around 75% firmer (blue) foam and 25% of the white stuff placed laterally. 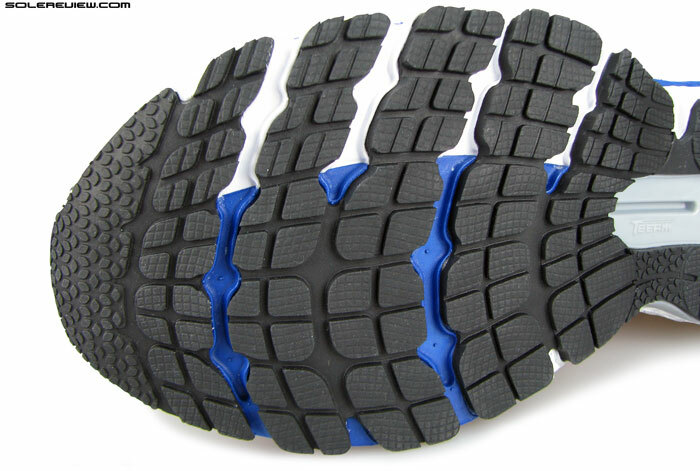 Actually, we prefer shoes with firmer forefoot as we feel they make push-offs more efficient and adds stability too. A segmented heel crash pad and angled bevel do their bit in the transition department. Molded insole laid over the midsole. Has a soft, blown foam base. Cushioned the 860 is. The inward collapsing thing of heel midsole adds to softness, but at the same time, shaves off degrees of lateral stability. The 1260 V4 fared much better in this aspect, as it had no such sleight of foam, just good old, dual density interlocking. Forefoot is firmer, but then blown-foam insole provides relief on top with its cushioning efficacy. 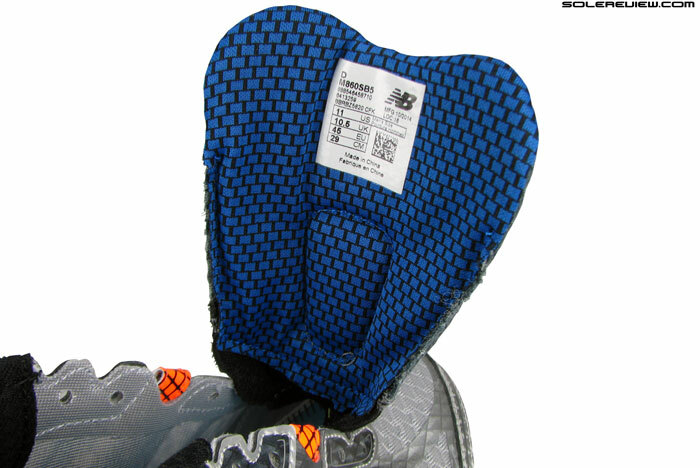 This is the same insole as what’s used on the 1260 V4. The gap under outsole heel splays under footstrike. Fair degree of responsiveness too, resulting from two things. There’s that lateral gap we spoke about, and also the center of outsole heel is an open space. So there’s some trampolining effect there, not unlike the 1260 V4, but just to a lesser extent. 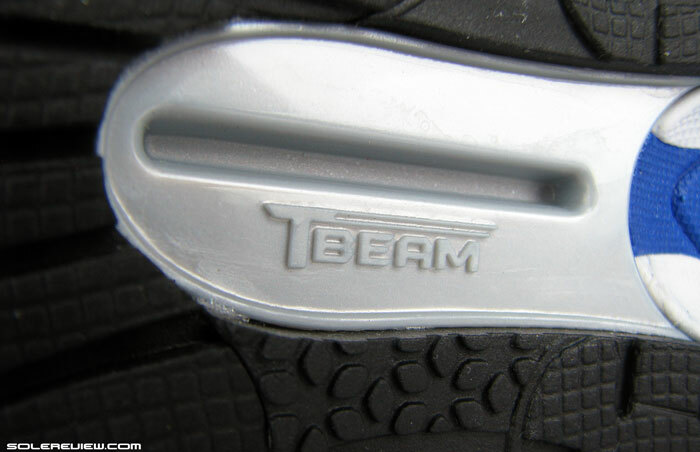 Midfoot is fairly rigid, as there’s a mini version of the T-Beam plastic shank we saw on the larger 1260 V4. This keeps the center of the shoe from twisting sideways, and moves the flexing point ahead – where the shoe is supposed to bend. It prevents something like this from happening. Lots of blackness underneath. Blown rubber in the front has good traction, and harder density at rear takes impacts well. Despite using a midfoot shank, New Balance is still generous enough to cover the complete underside with rubber. Hard wearing compound under the heel, and softer blown rubber under forefoot. Traction feels great on the 860; tenacious front grip and not-so-bad stickiness at the back. Durability seemed somewhere between Brooks and Saucony carbon rubber. ‘D’ width upper has a Goldilocks fit, neither too wide nor too narrow. 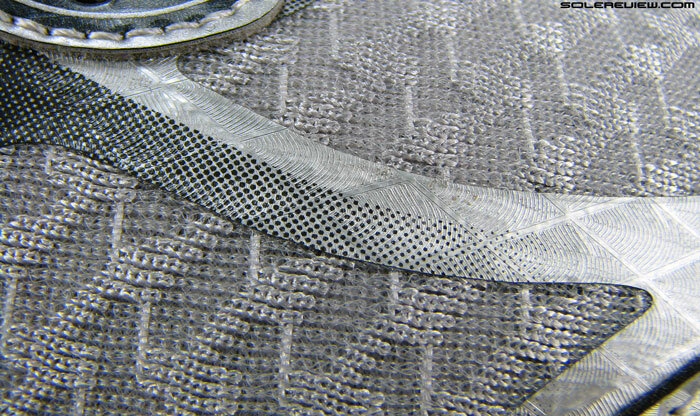 Premium looking overlays over a close-knitted spacer mesh. We’re on our fourth New Balance review here, and the upper fit continues to impress. In a sideways standard ‘D-regular’ size, forefoot space is just right and so is the toe box height. Of course, this being New Balance, there are options of B, D, 2E and 4E widths available, but the medium D should fit a large percentage of runners. Materials are top-notch, textured synthetic leather, fused overlays, premium mesh and all. 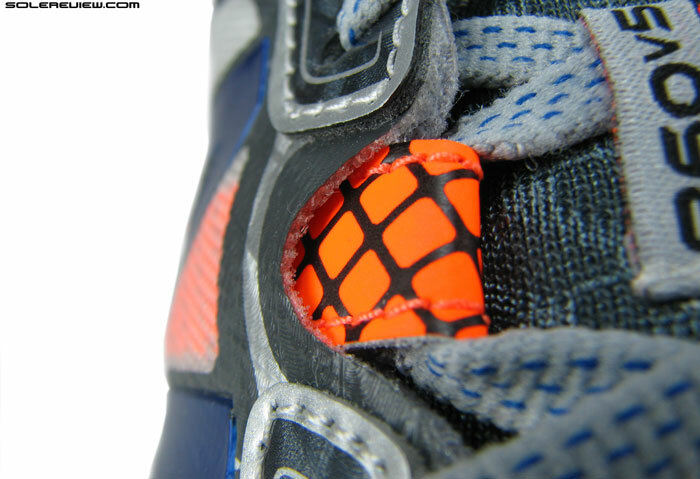 A free moving midfoot strap (orange) adds to the cinching system. The strap extends from the base and connects with the lacing. Smooth interiors, but the tongue tends to fold over in the front. 860 incorporates a free moving strap into its upper for better midfoot lockdown, and at the same time keep the foot from sliding forward. It is functionally effective, without uncomfortable pressure as it is sandwiched between the upper and lining fabric. Speaking of which, the lining’s pretty smooth so barefoot use is not an issue, save for one small, yet manageable concern. Ungusseted tongue, so there’s the expected sideways slide. Elastic portion in the front, with the goal of better draping over foot. The problem is, the edges fold under. Tongue design is similar to 1260 V4, by which we allude to its ungusseted construction and elasticated portion near its front. The stretch portion is supposed to help the tongue drape better over the foot, but the tongue isn’t as wide across as it was in the 1260 V4. So when pulled, the edges fold under itself, and this can be sensed over the foot. In our case, we needed to reach inside with our index finger and straighthen things out. Now where did we encounter a similar bug? Ah, the adidas Adios Boost 2. Lace length was another area which could see some revisions. The 860 V5 comes with semi-elastic laces (similar to Saucony Guide 8) which do a great job at staying tied during runs, but they are too long, which has the tips slapping the sides. …while being lower on medial. The goal is to provide greater medial side support. Wish there was wee bit more collar padding. New Balance’s ‘Asym heel’ is used on the 860 too. Which is this internal stiffener counter with different medial and lateral heights. The medial side is higher and lateral is lower, as seen in the pictures here. The underlying logic is to give more support to the foot on inner side. Regardless of design intent, extra upper stability doesn’t hurt. Heel collar is good but not great. There’s some padding thrown under soft lining, fairly basic set-up. Only the toe bumper is reflective. 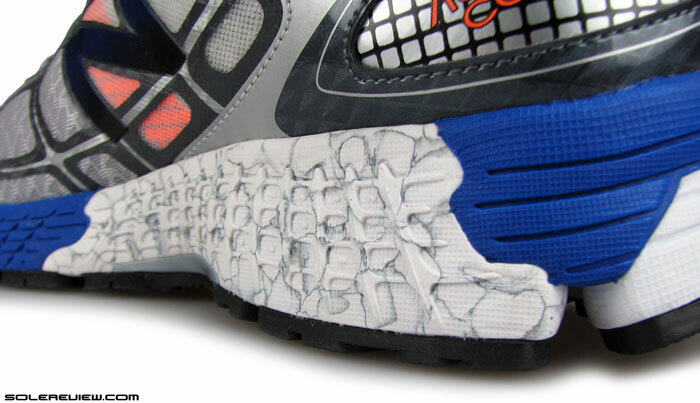 There is close to zero reflectivity on 860, with its application restricted to just a tiny strip on front. We think heel visibility to be necessary too, in case (for some reason) you are running in the same direction as approaching vehicles. With a low beam set-up, shoes are the first part to light up from a distance, not running shorts or tops. The 860 V5 has its own place and purpose in its price band, exhibiting the highest degree of motion control amongst the new $110-130 ‘guidance/stability’ shoes we’ve recently reviewed. That would be the Asics GT 2000 3, adidas supernova Sequence 7, Nike Structure 18 and the Saucony Guide 8. We’d even throw the Brooks GTS 15 in this list too, based off first impressions. And one more thing. This shoe isn’t made in the USA, like the 1260 V4, but in the far east, the foundry of most modern day running shoes. This doesn’t mean good or bad, just saying. Thanks for the suggestion, but we won’t be reviewing the Tailwind 7! But in shoe design when it comes to the word stability it’s really a case of using the same word for 2 different things…it’s a lingual shortcoming…and english is my 2nd language but I’ll try my best to explain. In the structure there certainly is “instablity, but is in a single axis towords a single side. Overpronators have a overpronounced mltion towards the medial side and the shoe is designed to be unstable towards the lateral side. It’s a case of using an opposing force to counteract an unwanted force. This would be bad for a neutral runner though. That is the “motion control type stability”. And that is a given, no way better way to counteract overpronation in my opinion though shoes must be matched to amount of the runner in question. Secondly there is the “other stability”. It doesn’t serve any purpose of counteracting any kind of opposing force. It requires a ver efficient runner, with strong legs and a good technique. This is the bad type of instability. 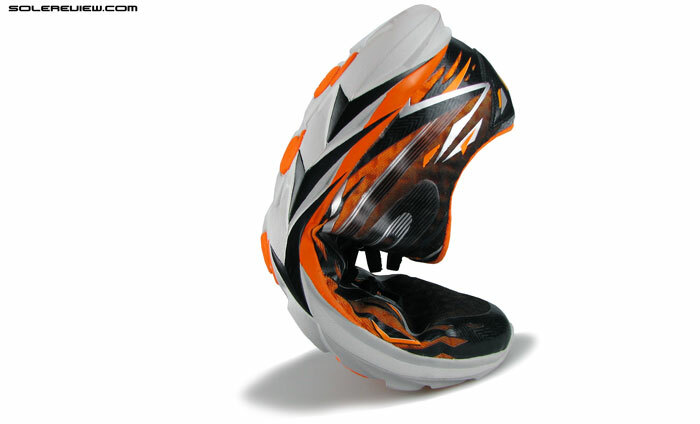 Generally thismis found only in neutral or badly designed stability (motion-control) shoes. Usually when the sole unit is to thick and unstructured. Hear you, but our point is that not every runner gets ‘stability’ when looking to buy a shoe. They might make their purchase thinking that the shoe is rock stable, but find out the shoe to lack stability. Honestly, we think the whole pronation control thing to be a bunch of pseudoscience with its origins in the early 1970’s. You’d also be surprised to know how many so called ‘neutral shoes’ behave similarly to pronation control shoes. Running form is the key, not shoes. Definitely: if it has a lateral crash-pad on the heel it certainly causes “instability”. And yes, it certainly is element that a runner rather take time and strengthen the area that causes over-pronation because there really is no “proper” method of motion control. Agree on both points – torsional stability does universal good, and key to staying injury free is to have good form and have conditioned musculature. They have a problem for european users, as many NB the wide size is too big for european feet, even de D.
Personally, talking about “stability shoes” my favourite stability runner shoes are the Nike structure 16/17. Don´t feel good with heavy and hard control stability shoes. You right, I love Adidas because of my narrow feet and now with the boost they have a really good product. They sale a lot here in Europe. The GTS 15 is a stabler shoe than the 1260, 860 and the Kayano, as it maintains better lateral stability. You have couple of options. Try the GTS 14 which has better cushioning than 15 while providing support. Also get yourself fitted with the Saucony Hurricane ISO. It is firm, but no harm in trying. I wish I read this article prior to purchasing this shore. I had version 4 and was pleased with the shoe, but I absolutely hate the fit of the tounge and laces on this show. I have to make sure the tongue edges unfold every time I put the shoe on! And to think that we were the only people to notice that! Yep, me, too. Have run thousands of miles in v3 and then v4, and the upper in v5 was so irritating to my feet (both L & R) that I had to send them back. Any suggestions for a suitable replacement? Having trouble finding v4 in my size and know I won’t be able to for much longer. Thinking maybe Ravenna? Yes, the Ravenna is close, but you need to watch out for the shallow toe bumper. Typing after having to do that to the shoe for the thousandth time- explains all the typos…. I have a lot of feet/ankle issues (main issues, wide feet and high arches). I loved my NB 860v5 Women’s Stability and Motion Control Shoes until I started to wear more on the outside heel. I’ve understood where this comes from and why it occurs, but I’m having trouble finding a similar NB shoe that might be better for me, but still have the features that work well for me. Any suggestions? Or should I stick with the 860 and have to buy earlier and more often than I’d like (less than 6 months for a non-runner). I have the Brooks Adrenaline GTS14 now and previously owned the GTS13s. I’ve loved them overall, except lately I have had some Achilles tendonitis pain. I am in dire need of a new pair. I am writing here because I took a look at the review for the GTS 15s and I am a little bit concerned in the dropoff in the heel cushion from the 14s to the 15s. These NB 860s seem to be another alternative to Adrenaline. I have narrow feet with a higher arch. 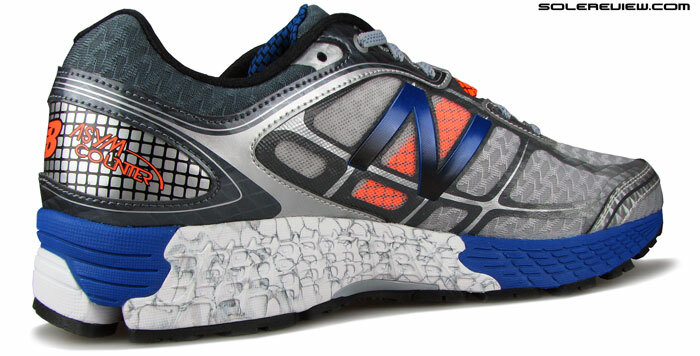 Do you feel that the NB 860s provide a better cushiniong at the heel than the GTS15s? Any other options you can recommend that would come close to providing nice heel cushioning and maybe be on the more narrow side in the forefoot? 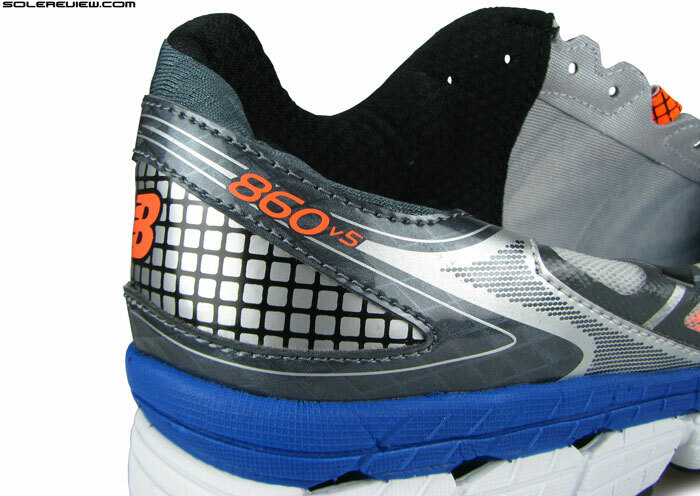 Yes, the 860 has better heel cushioning than the Adrenaline. Also worth trying the Brooks Ravenna 6 and Transcend 1. Not sure whether these shoes will work for you, but worth giving the Brooks Adrenaline GTS 15 or the Saucony Guide 8 a try. We haven’t tested the GTS 16 or Guide 9 yet. 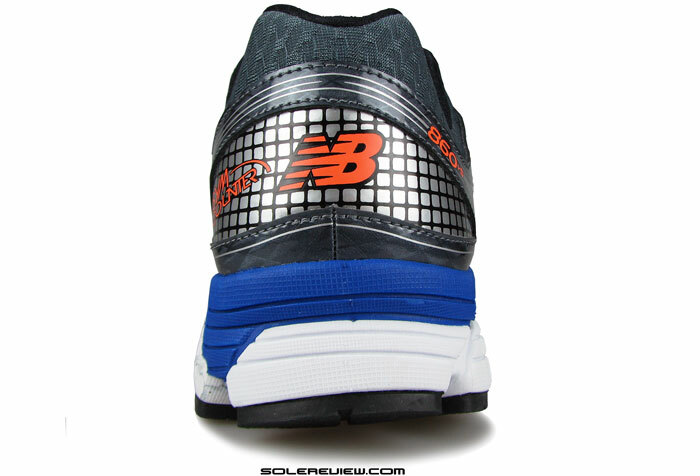 Even the New Balance 1260 v4 is nice – blends in cushioning and support well. If you have wide feet, then the Lunarglide 7 should work better for you. I am thinking about buying these, I have had Structure 16’s these were ok on my gait test but not great… Structure 17 performed badly on gait. Strange they were different. 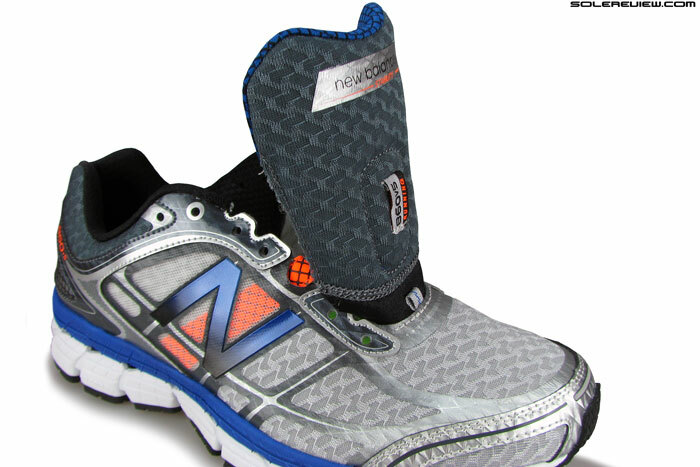 I overpronate as I land and to combat this I am advised New Balance 860v5. Do you think this is a good idea? I am a 10 in the Nikes and was going to choose 10 in new balance also but maybe 2e width. Thoughts greatly appreciated. Strange. Structure 16 and 17 have the same midsole, and hence should ride the same. Will the 860 work for you? Not sure, but good idea to go 1-up on width. Thanks for the great analysis for this shoe and all the other shoes that you review on this great site!. 860v5 that I currently rotate though I’m wearing the v5 more and more. little better arch support and v5 softest with good arch support. qualities I normally don’t love in shoes. It felt a little bit like a minor war in my footbed. After a day or two of wearing them however, this feeling went away and now they are quickly becoming my favorite shoes of all time. They are very comfortable and they make my back (I have a mild spondylolisthesis) and body feel better. They are also in my opinion the best looking shoes (dark blue model) of the 860 series that I have owned. I think they fit as well or better than the v3 and v4 and I have narrow feet and a narrow heel. The somewhat elastic laces really helps get your foot in nice. They seem very true to size. Some of the other stability shoes I’ve tried are the Saucony guide and omni (8mm heel toe differential for some reason does not feel good to me) every version since the 4 and 10 – the 11.2 mm heel toe drop of the v5 (according to runners world) feels perfect. I’ve also tried Asics 1000, 2000 and their versions and for the most part the gel technology they use feels too squishy to me and I don’t feel like the heel is supportive. Nike structure 15 was nice but everything since then I have not liked at all. 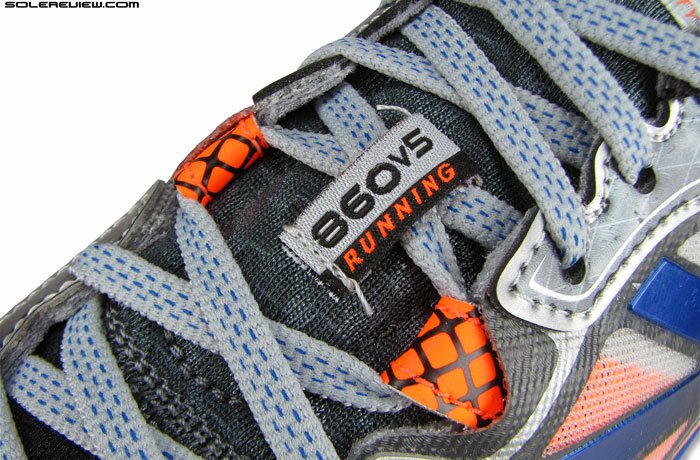 Anyway, love the 860v5 and will be ordering many more. Thanks again! Actually, after having walked around in them for a week or so, I have found the arch support in these to be too aggressive. It feels like most of my foot is on the arch support with a low sinky heel. It initially felt like this to me when I first tried them but then got a lot better the next day but a little time away from it brings it right back. Arch hurts. Back hurts. I’ve put them on the side and went back to the 860v4… much better.